Astronomers using the Kepler Space Observatory have spotted a record five planets crammed in close to their parent star, 1,100 light-years from Earth. 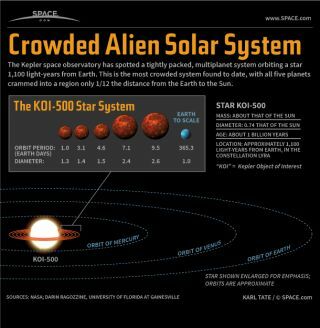 Astronomers using the Kepler space observatory have spotted a tightly packed, multiplanet system orbiting KOI-500, a star 1,100 light-years from Earth. This is the most crowded system found to date, with all five planets crammed into a region only 1/12 the distance from the Earth to the Sun. The five exoplanets have orbital periods of 1.0, 3.1, 4.6, 7.1 and 9.5 Earth days. Their diameters range from 1.3 to 2.6 times that of Earth. The name “KOI” means “Kepler Object of Interest.” These are stars observed by the Kepler Space Observatory and found to have a periodic dimming characteristic of objects orbiting the star and eclipsing it regularly. The news was confirmed by Darin Ragozzine, a planetary scientist at the University of Florida at Gainesville.